Unlike other scar treatments, Dermaflage is a unique makeup system invented by Hollywood makeup artists to cover up the appearance of unsightly scars and skin flaws. This makeup kit works by evening out the skin for a smooth finish and then covering up the scar, blending the color to give the skin a perfect appearance. 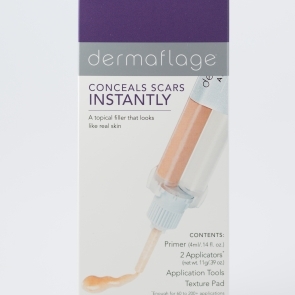 Dermaflage claims that their makeup kit can fill in any scar, and the concealer provided will match any skin tone to effectively conceal imperfections in the skin due to scars. Primer: Isopropyl Alcohol, Tetra-n-Propyl Silicate, Tetrabutyltitanate, Silicone Platinum Catalyst, Lavandula Angustifolia Oil. Dermaflage (pronounced like the end of camouflage) is an effective makeup kit that works wonders at hiding embarrassing scars. This three step process involves putting the primer on the area of skin you would like to cover, and then applying the silicone base. When applying the silicone base, you need to even it out with your skin, and keep in mind that it dries rather quickly so you have to complete this step pretty quickly. It will more than likely take you a couple of times to practice in order to get the hang of it. After the silicone base, you apply the concealer. As you can see, this product works by filling in the scars, and then evening up the skin tone. This product is exceptional at hiding scars, and has received rave reviews by many individual customers. Because the make-up is silicone based, consumers won’t have to be concerned about the make-up looking dried out or even cracking midday. In addition to this, the make-up is both waterproof and sweat proof, guaranteeing you long lasting coverage regardless of where you’re going. You can also apply your regular make-up over Dermaflage. The pros far outweigh the cons with this product, but there were a couple downsides to Dermaflage. With the silicone drying so quickly, you basically have to become an expert at applying this. I would advise customers to set aside some time to simply play with the product to guarantee that they know how to use it versus simply trying to throw it on at the last minute before running out the door. As with any make-up product there is a small risk of side effects such as irritation, but there are no reports of users that have experienced side effects or allergic reactions. The only remaining thing that we didn’t like about Dermaflage is that it isn’t a permanent solution, and only works on scars that you need to fill in. The prices of Dermaflage are flexible, with products being sold both individual as well as in kits so that customers only purchase what they need. This product goes hand in hand with a permanent scar removal cream!